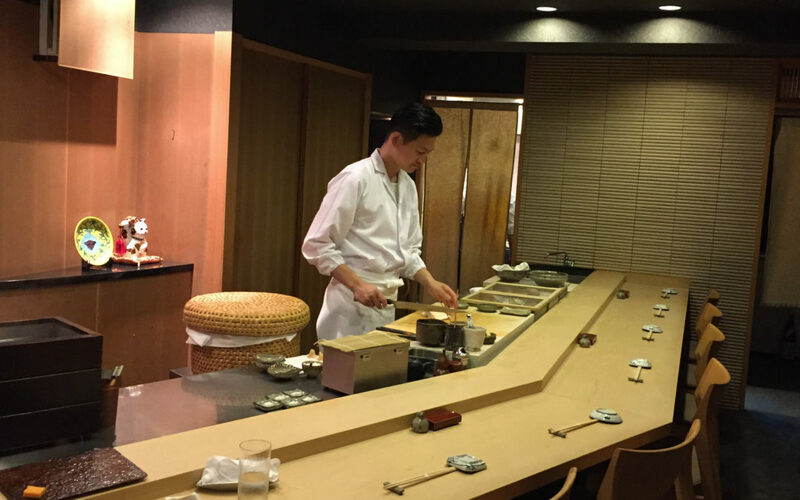 Variety & Freshness (two separate categories) – Hoshiyama only served 18 cuts of fish, nothing more, so that landed at a solid rating of 8. Of those 8, there were a handful of stellar cuts, but also a few questionable ones. Not a huge fan of questionable fish. You? Preparation – The only category where it’s not math, 100% subjective. Hoshiyama had a handful of knock me on my booty, shut the front door, this is nuts-cuts, a couple of complete misses, and MAJORITY of just passable cuts. Subjectively, BLAH! Cost – 20,000 yen (roughly $180 USD) for 18 pieces – averaging at $10/piece. Pricey for this quality! Location – During my SUSHI MIYAKAWA write up, I shared how locating restaurants in Japan was a world of difference from locating them anywhere in the US, especially NYC, which is 95% a GRID, and almost everything is on the ground floor. Per Google maps, Sushi Hoshiyama was a 6 minute walk, 0.3 miles from where we were (at a once-a-year sake festival – yay!!!). 30 minutes later, we were at a complete loss. Luckily for us, the Japanese folks in Osaka are almost as friendly as the Japanese folks in Sapporo. We knew we were on the right block, when we gave in, and begged for help. It still took those nice people close to 10 minutes in helping us locate. What lovely people! 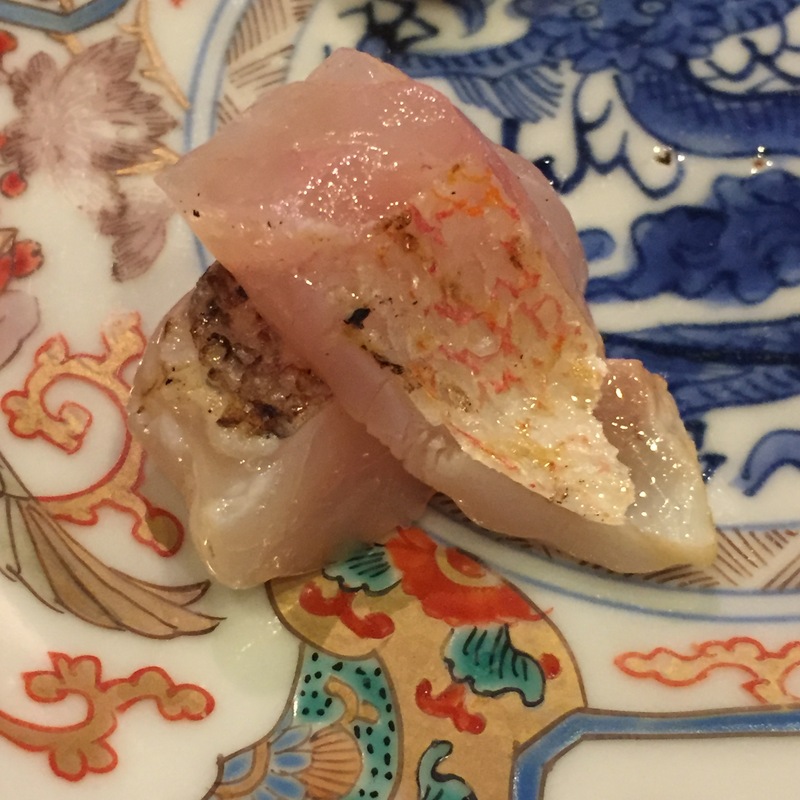 AMADAI (Sweet Tilefish) – Looks and tastes very, very much like an AKAMUTSU. I would need the side by side comparison to tell the difference. With the skin ABURIed (torched), and a little sprinkle of salt, this was an absolutely amazing piece. 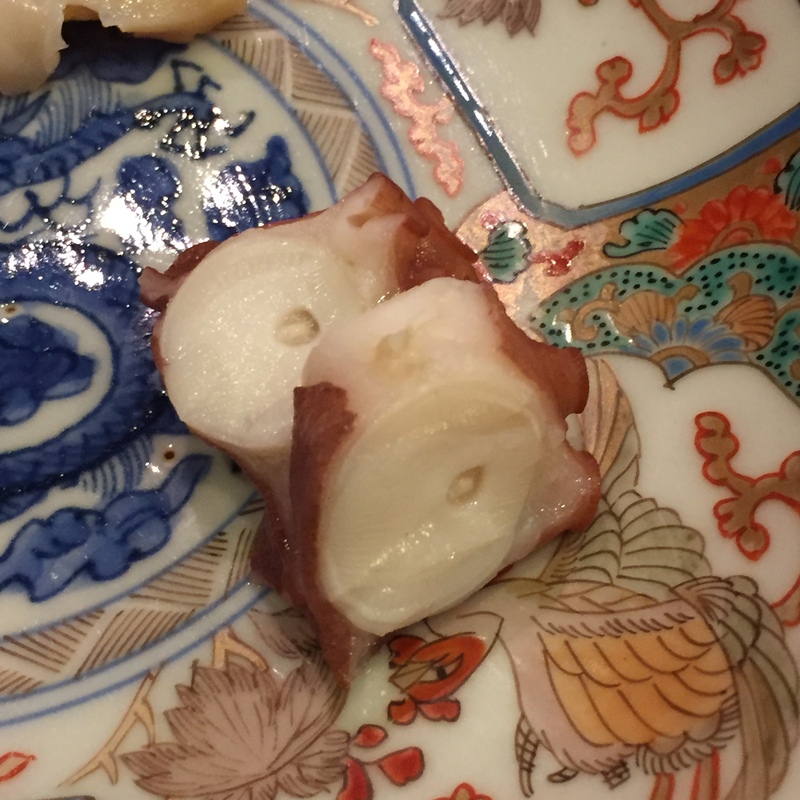 TAKO (Octopus) – Part tender, part chewy, this was cooked perfectly! Still quite a stretch from my favorite TAKO ever, at USHI, but still very very good. Also acts as a great transition between the AMADAI and the TSUBUGAI. 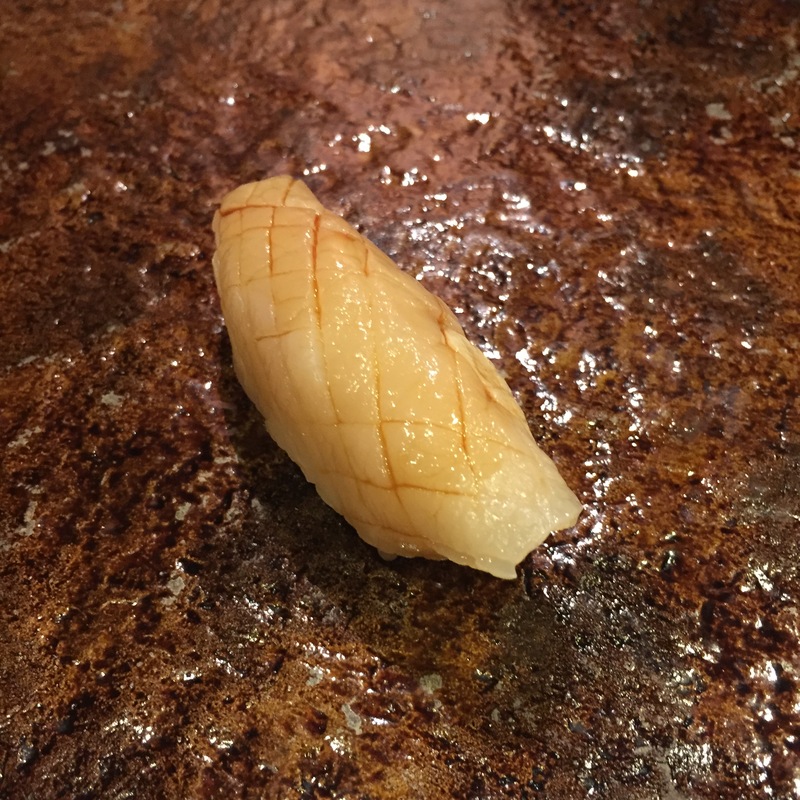 TSUBUGAI (Whelk) – TSUBUGAIs are so rarely served in the states. 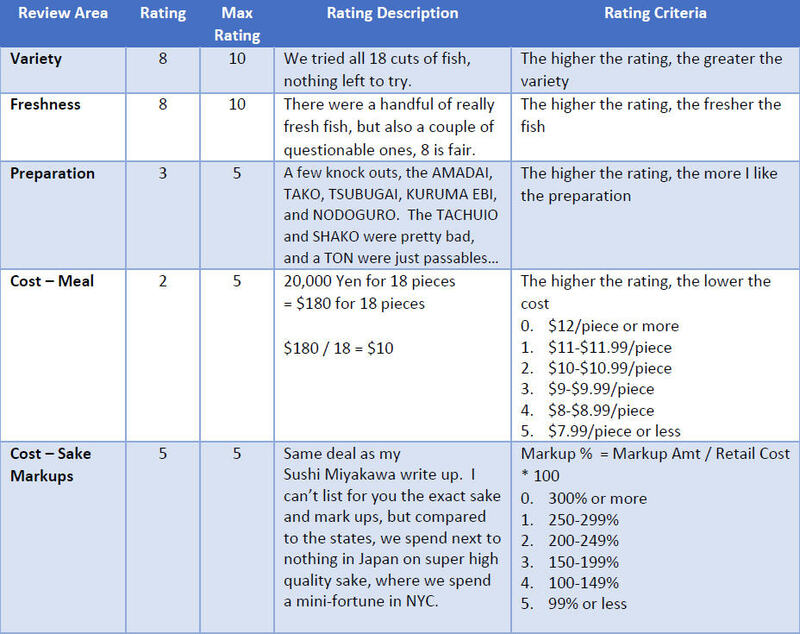 Chefs claim folks don’t like or order the shellfishes. I call BS! Why do we have all those lobster shacks? The tons and tons of oyster bars? Or restaurants with oyster happy hours to lure customers in? Americans LOVE shellfish! Just coming from Sapporo, where we had TSUBUGAI every day, we’ve really developed a taste for TSUBUGAIs. 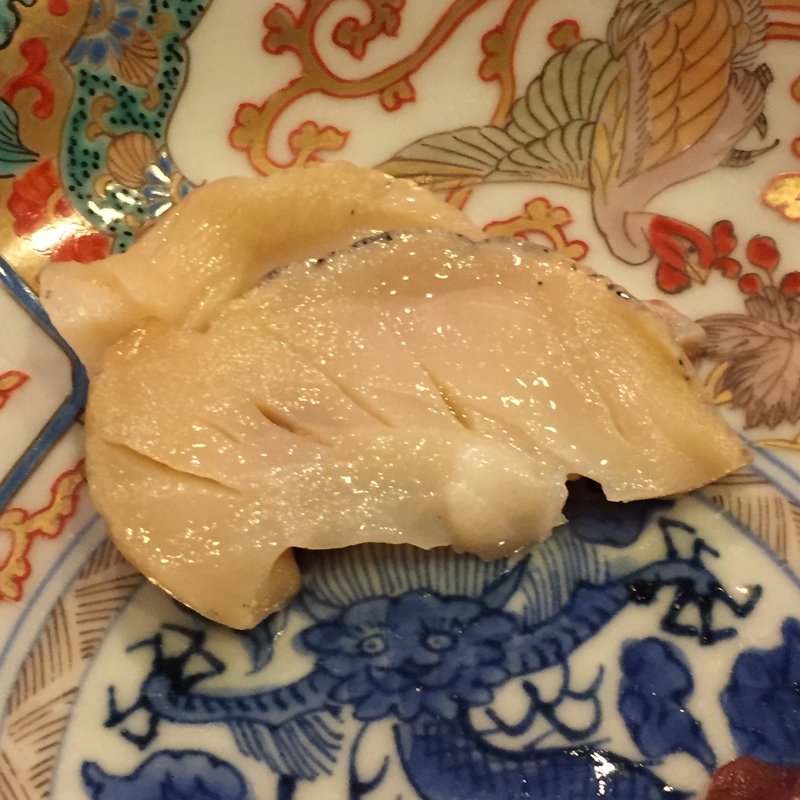 This was a huge TSUBUGAI, sliced fairly thin, but still had a fantastic crunch. DELICIOUS! 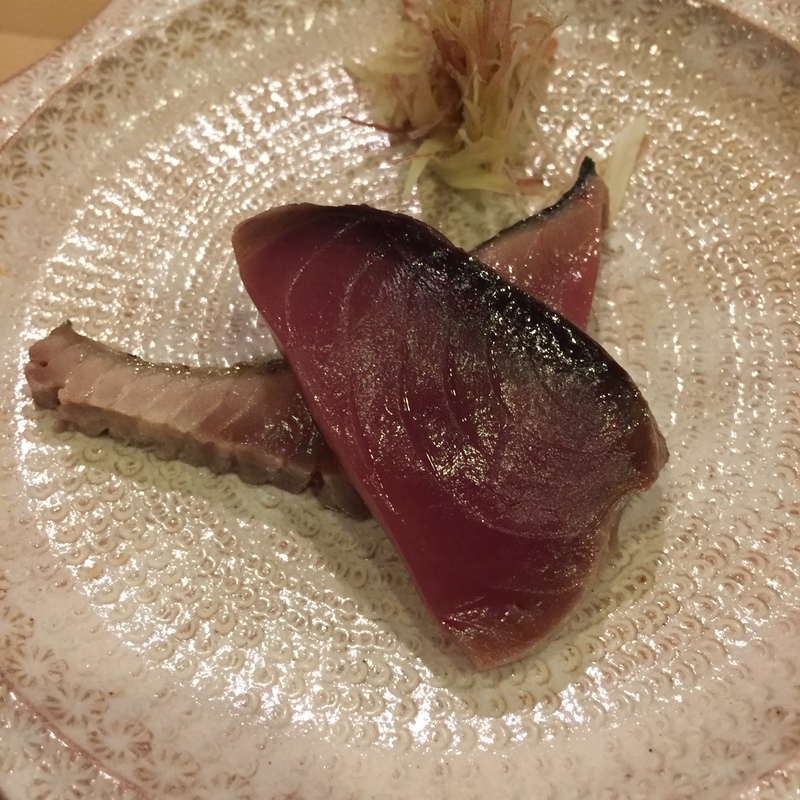 KATSUO (Bonito) – I really love the mild Japanese onion, goes great with BONITOs. The BONITO itself wasn’t all that and a bag of chips though… It was just passable. TACHIUO (Sword fish) – Grilled and topped with a ton of onion and sesame seeds. Eh… Nothing special. Nothing I would have ordered. 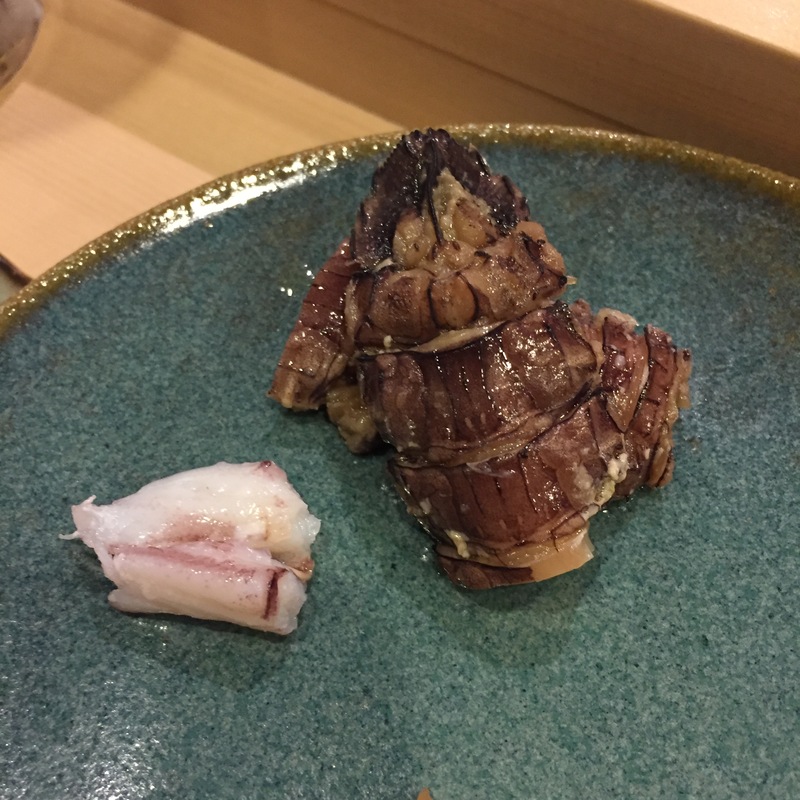 AOYAGI (Surf clam) – For an AOYAGI, this was pretty good, more tender and more flavorful than those we have in the states. Quality wise, it far pales in comparison to the lovely TAKO and TSUBUGAIs we were served earlier in this meal. Plus, it’s so commonly available all over the states. What a bore! SHAKO (Mantis Shrimp) – My least favorite shrimp of all time! Only a handful of sushi-yas serve this in the states, (i.e. JEWEL BAKO and KURA), and when we visit, I specifically tell them, NO SHAKO. BTW – I just noticed I’ve been saying “the states” a bit in this post, what I meant to say is NYC. Today’s serving presented SHAKO’s regular cooked shrimp texture, and bland as heck taste! Both the body and the arm (the white thing on the side) were complete waste of stomach space. BTW – we started with 3 really great servings, then went to 3 blah servings, and now this one is just plain out bad. 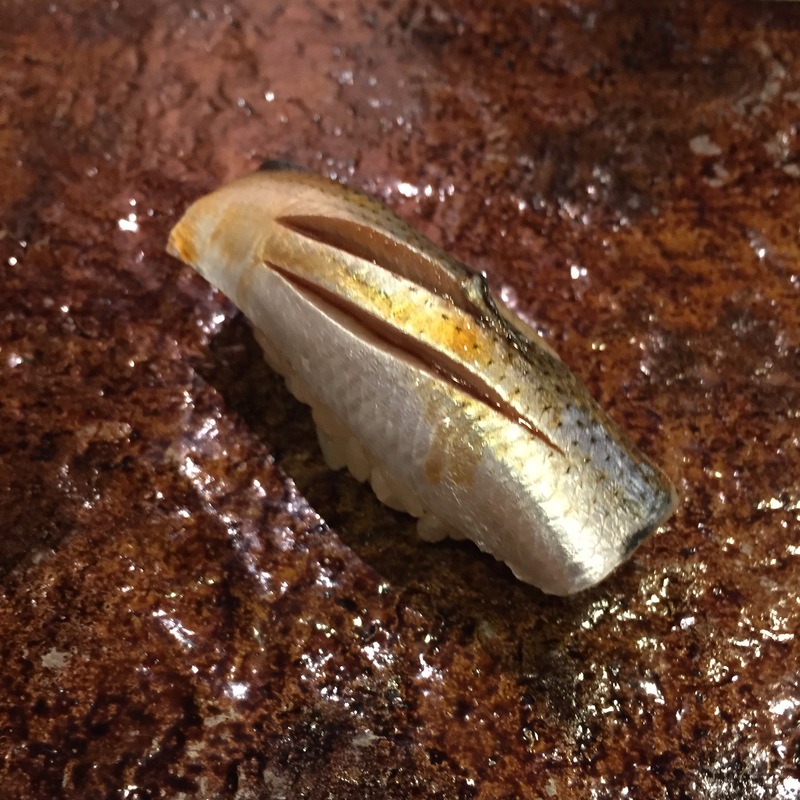 MADAI KOBUJIME (Kombu marinated Seabream) – My opinion? If a fish has been marinated in KOMBU, you don’t need to additionally top it with too much soy. I love MADAI, and I love it served KOBUJIME, so I’d love to say this was great, but it was SO SALTY. And this is me saying this! I’m the queen of salt! It was too much for me, I can only imagine what it would be for everyone else. 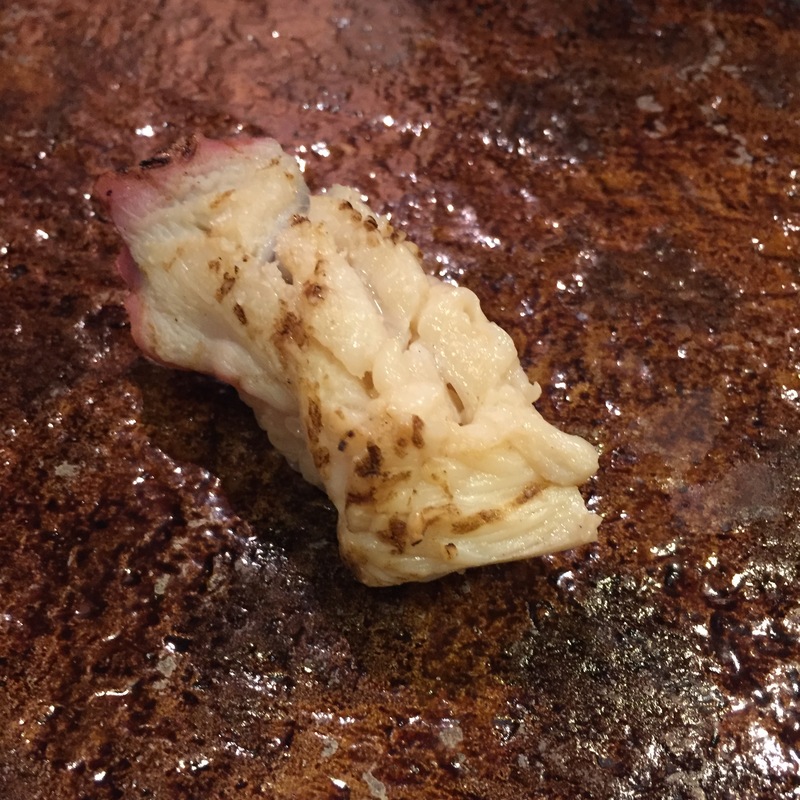 AORI IKA (Squid) – Good! After a bunch of blahs, and even a bad serving, I’ll take “good”! 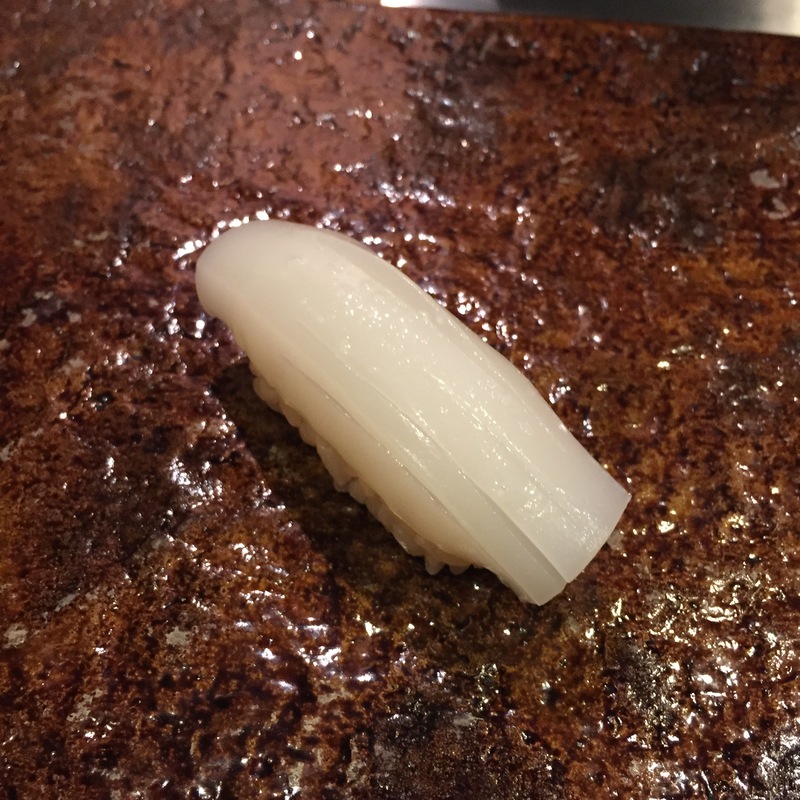 This AORI IKA still had a mild hint of sea, and scored nicely to cut down on the chew. Decent! 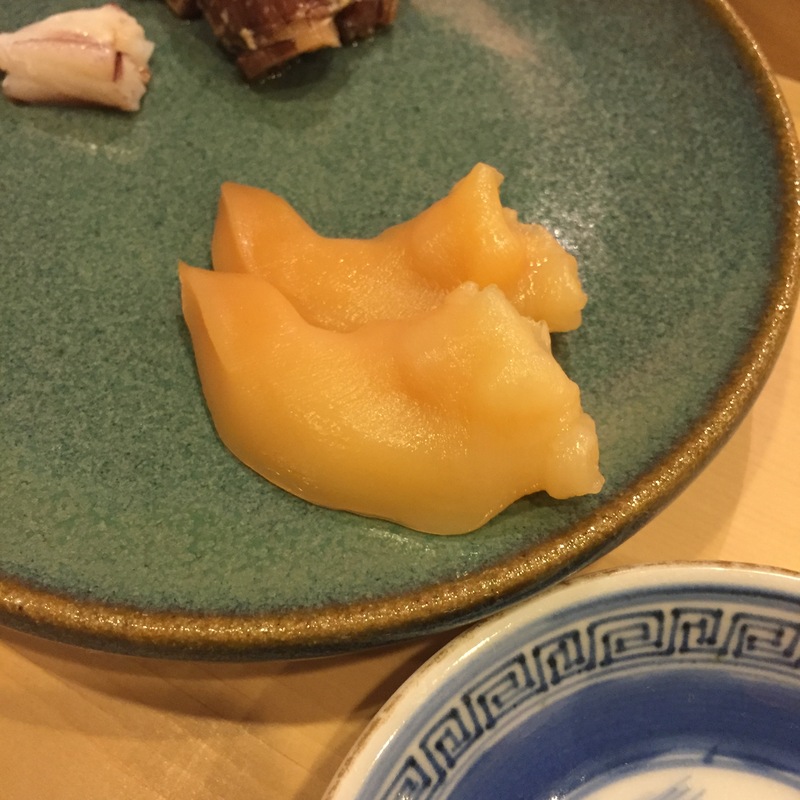 KOHADA (Gizzard shad) – Another good serving. Decently marinated, and not overly fishy. Happy enough! 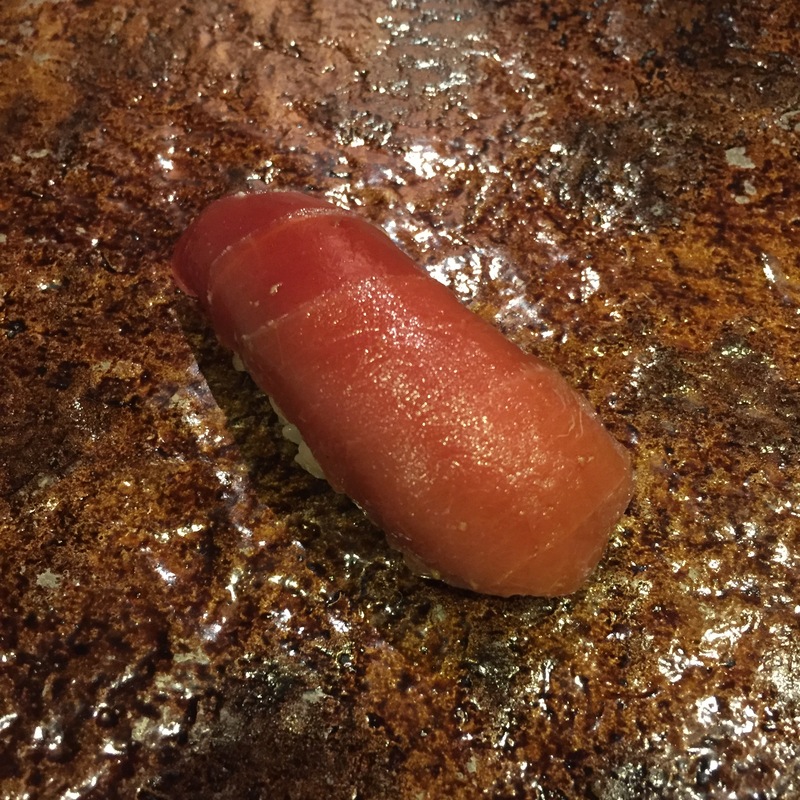 AKAMI ZUKE (Lean marinated bluefin tuna) – Good streak continues! This decently marinated AKAMI had great soy flavors without it being overbearing. No fishiness, no funkiness, and no veins/chewiness. Good job. 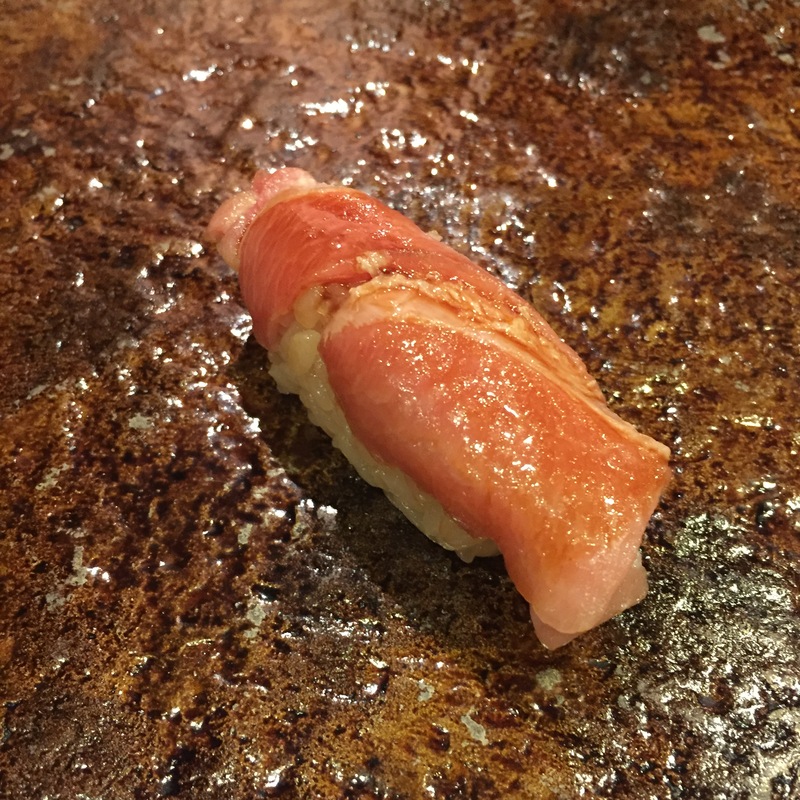 OTORO (Super fatty tuna) – Not as good as the AKAMI ZUKE, but still perfectly respectable. Taste wise, really nice no fishiness, no funky aftertaste. Texture wise, a big fat vein making this super chewy. 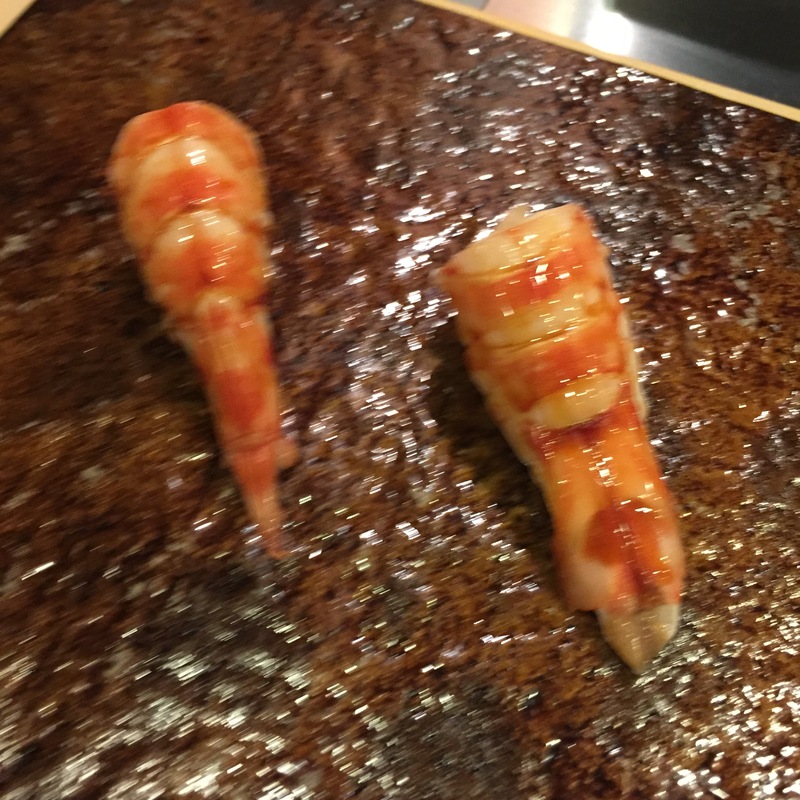 KURUMA EBI (Tiger prawn) – Sorry for such an awful photo! I had little space left, and I accidentally deleted the good one, leaving this super blurry one. Sorry! Like the TSUBUGAI, we’ve been having a TON of KURUMA EBIs on this trip, both raw and poached. 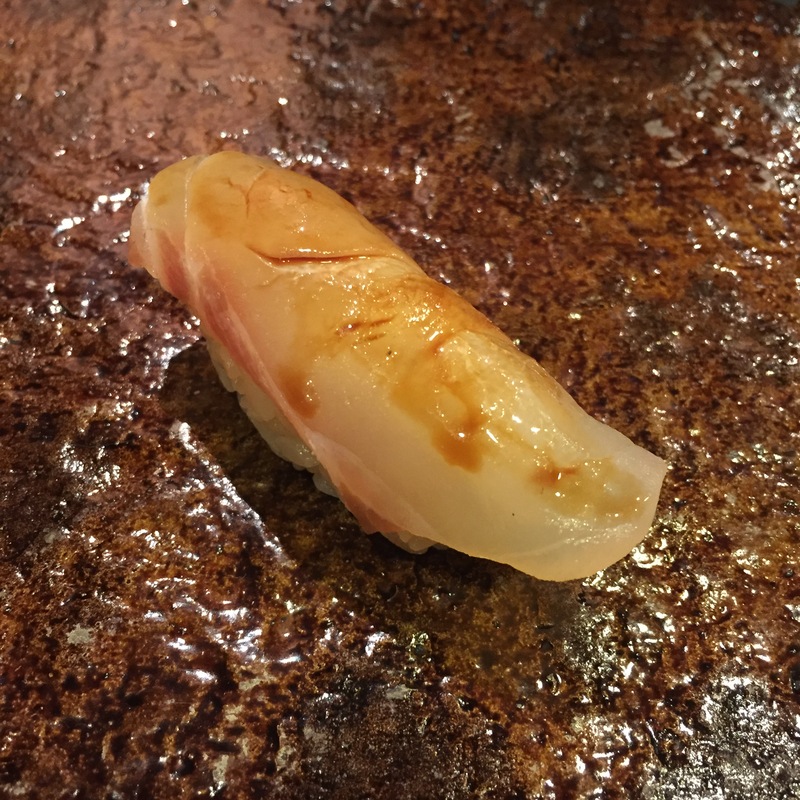 In the past, GINZA ONODERA, KANOYAMA, KURUMA ZUSHI all served the KURUMA EBI sporadically, but for some reason, we haven’t had ANY KURUMA EBIs this year in NYC. This particular serving was very good. Unlike the other EBIs, BOTAN, AKA, SHIRA, AMA, the KURUMA is the one EBI I actually enjoy cooked. When cooked and served with some of the shrimp brains, it renders a more complex blend of flavors. Very good! 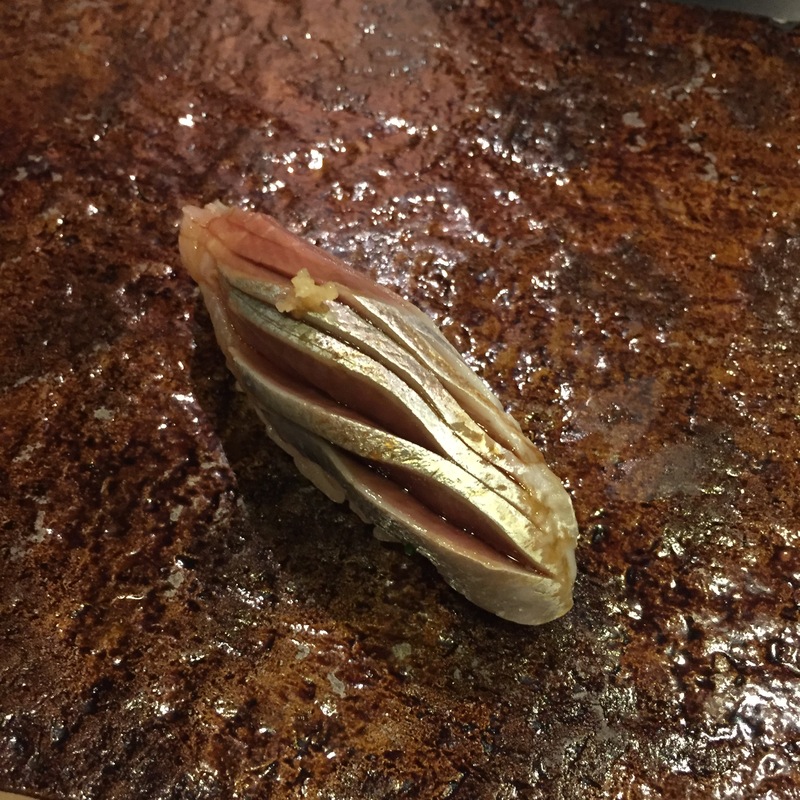 TAIRAIGAI (Penshell clam) – Truthfully, I am not a fan of this clam… It’s not like any of the other clams. This clam’s natural texture is more like a scallop, tender but never a crunch. But unlike the scallop, it’s just a milder fish. Without the soy, I don’t know that there’s any flavor. BLAH! 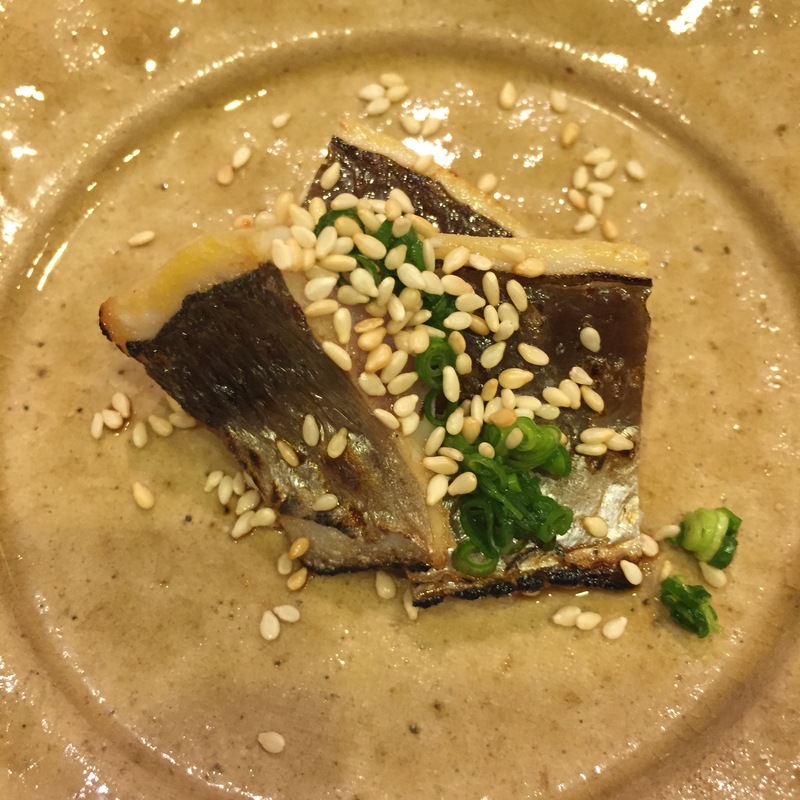 IWASHI (Japanese Sardine) – Very good, borderline great serving of IWASHI. One of my favorite silvers, the deep and tight scoring of this fish made the soy seep in nicely. The shaved ginger was very, very light, which was a nice twist. Unrelated to this serving, the ginger here blows! It is very aged ginger, meaning super duper spicy ginger. It doesn’t just clear your palate, it kills your taste buds! 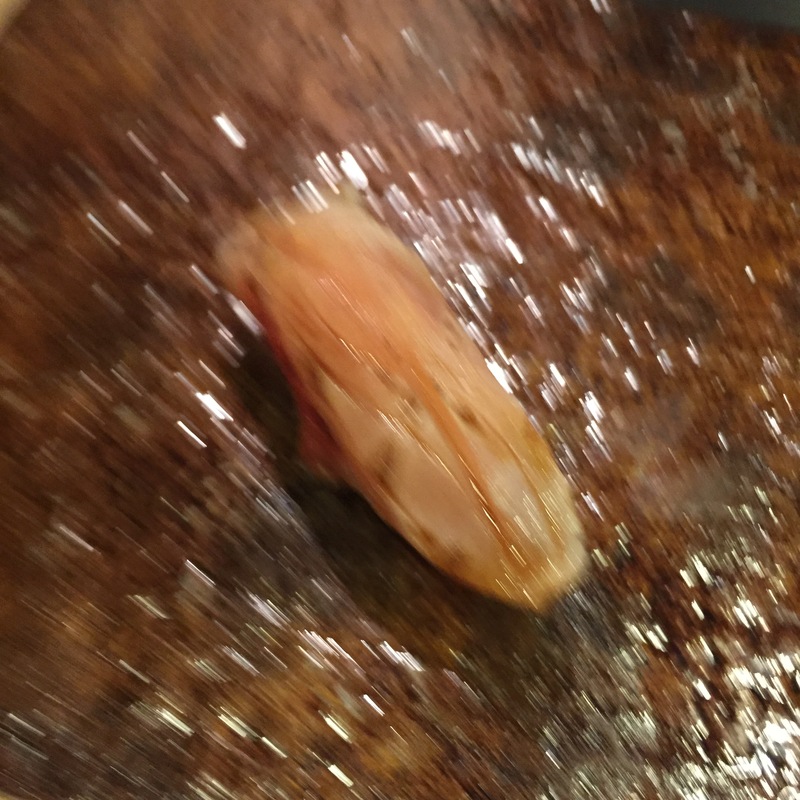 KINMEDAI (Golden eye snapper) – Again – apologies for the poorly taken photo. 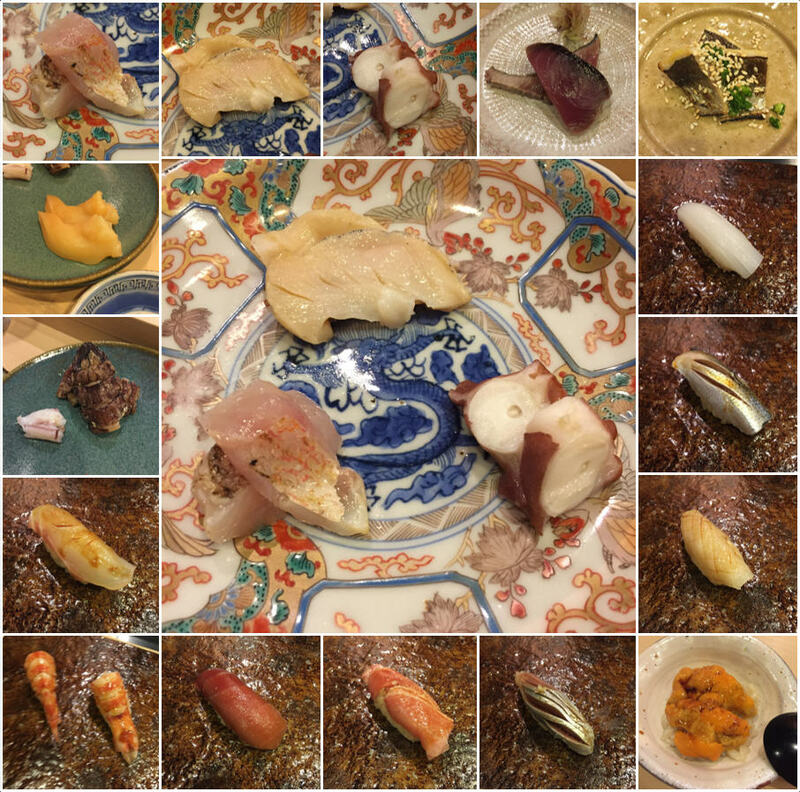 This was a very good serving of KINMEDAI. Nicely ABURIed on the skin, and topped with soy. Very good! NODOGURU (Black throat) – Doesn’t look at all attractive, but it swas pretty good. It’s pretty hard to mess up a NODOGURO though. Nicely torched, small squeeze of citrus, and topped with a few sprinkles of salt. This was better than good, tipping more to great! 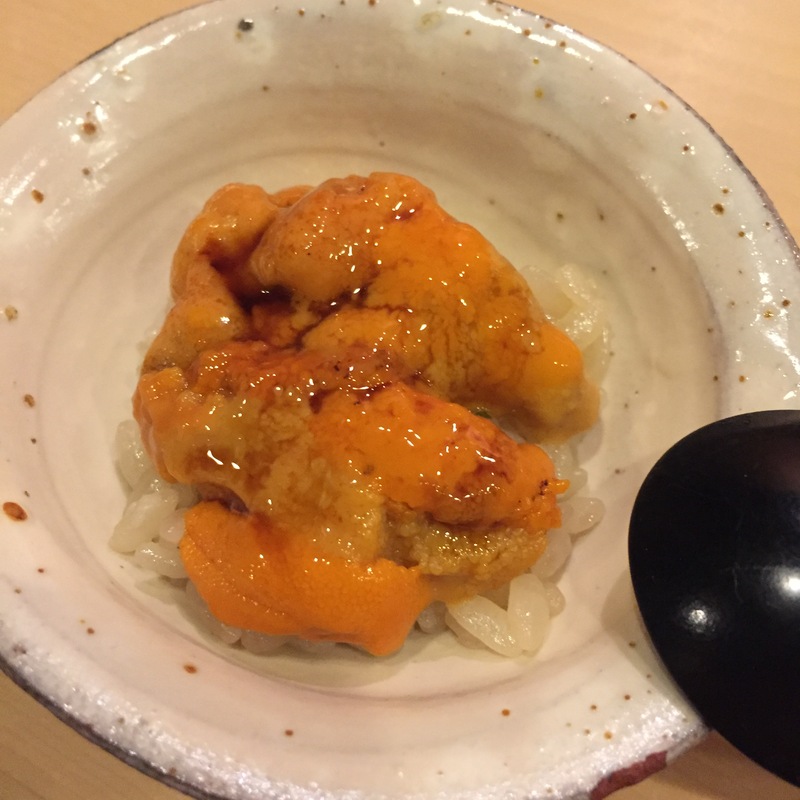 Hokkaido UNI – Ohhh… Too bad for Hoshiyama, we just arrived from Sapporo, where even the most common of sushi-yas have fantastic UNI. Comparatively, this barely qualifies as mediocre.